One of the largest inland mangrove areas in Australia is located at Lake MacLeod. Mangroves are complex habitats that provide homes to plants and animals that have adapted to live in harsh saline conditions. The Lake MacLeod wetland system, on the Eastern boundary of Gnaraloo Station, is a highly sensitive environmental area. It is one of Australia’s most important stop-over and drought refuges for migratory shorebirds, and it supports one of Australia's largest inland communities of mangroves. It is linked to the Indian Ocean and the Ningaloo Marine Park through underground water channels from as far as 18km away. Every year endangered sea turtles come ashore to nest on these beaches. The Gnaraloo Bay Rookery and the Gnaraloo Cape Farquhar Rookery are some of the larger known loggerhead nesting sites on the Ningaloo coast. GWF scientists work with the Gnaraloo Turtle Conservation Program to identify, monitor and protect the rookeries. Sea turtles depend on dark skies to orientate and inappropriate coastal development poses serious threat to the turtles. Sand dunes play an important role in protecting the coastline. They act as a buffer against wave damage during storms, protecting the land from the sea. They also provide nesting habitat and feeding areas for turtles, crustaceans, shorebirds and plants. They may contain Aboriginal heritage items, burial grounds as well as the remnants of megafauna that used to roam the Gnaraloo area. The dunes are fragile and can be seriously damaged or destroyed, through activities such as 4W or quad bike driving. The Gnaraloo Wilderness Foundation works to protect the wilderness and wildlife. The Ningaloo Reef is a world heritage listed site and one of the world’s largest fringing reefs. Turtles and a huge variety of fish, sharks, whales and coral species can be found here. It is regarded as one of the last natural wonders of the ocean. But in recent years, coral reefs have come under threat from global warming and human activities. The Gnaraloo Wilderness Foundation will do everything possible to keep this national treasure healthy for our future generations. The geological history of the Gnaraloo area involved marine sedimentation, tectonic stress and the uplift and exposure of tertiary sediments. Very little is currently known about the Gnargoo Range and our scientists are enthusiastic to find out more. Sandwiched between the coastal dunes and Lake MacLeod, Gnaraloo has a large area of almost untouched Australian scrubland. This hot and arid environment is a home to diverse wildlife and plants, some of which are endemic and unique to the area. Many of these species have never been catalogued so there could be more undiscovered species that depend on this area to survive. There are over 140 Aboriginal sites registered in the Department of Indigenous Affairs (Western Australia) within the Ningaloo area. Such areas are protected under the Aboriginal Heritage Act 1972 (Western Australia). The Baiyungu people are recognized as the traditional owners of the Gnaraloo coastline. Gnaraloo has a network of underground caves and caverns, extending up to 18km inland. They sometimes form incised river channels and groundwater resources. These caves provide habitat to stygofauna and troglofauna, some of which are rare and believed to face extinction. Stygofauna is an ancient group of animals dating from pre-Gondwana that live in water in the underground caves. Troglofauna is a group of animals living in air spaces in the rocks in the underground caves. Many of these species are still being identified by scientists. 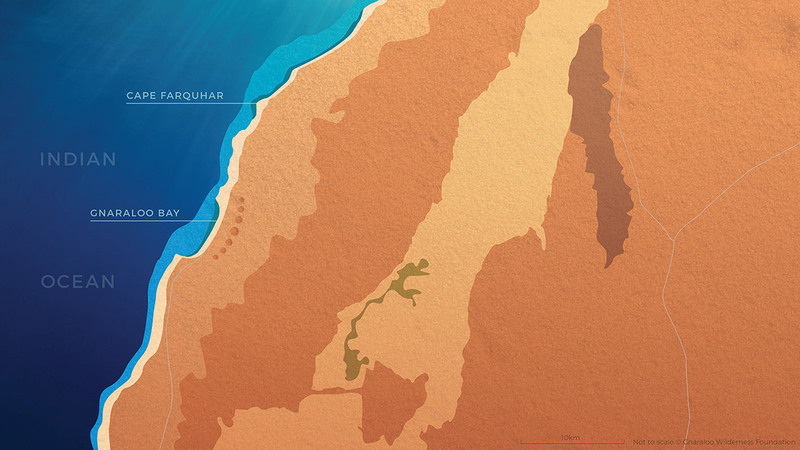 Gnaraloo has important foraging, mating, nesting and resting areas for nationally threatened sea turtles and migratory birds, located at the southern end of the Ningaloo Coast World Heritage Area. It borders an inland wetland of international significance. The United Nations Educational, Scientific and Cultural Organization (UNESCO) added the Ningaloo Reef to its World Heritage list, stating that its ʽlush and colourful underwater scenery provides a stark and spectacular contrast with the arid and rugged landʼ. Gnaraloo is home to stunning fish, corals, turtles, sharks and whales. The coastal and marine areas are magnificent but fragile natural assets, notable for their sense of remoteness and pristine beauty. Gnaraloo is home to a diverse and natural ecosystem. Its landscape is classified as having high environmental sensitivity and provides habitat for numerous animals and plant species. Located on the eastern boundary of Gnaraloo, Lake MacLeod supports one of the world’s largest inland mangrove habitat and is considered to be of high national and international significance. There are so few places in the world where you can see billions of stars, planets and the milky way. Gnaraloo is one of them. Gnaraloo features a magnificent geological and dynamic landscape, including its very own Gnargoo range. Within the karst ecosystems, stygofaunal and troglofaunal species yield information about evolution of life on earth.